No, they've not been postponed so that I could return to Washington to mediate a solution to the current financial crisis. Let's go! From Andrew B, a link to a real treasure: full scans of Hostess ads from the 1970's that ran in comic books. From just about everyone, a link to the Corpus Clock, designed by Stephen Hawking. It's bizarre, and here's a video of how the clock works. From Vahur Teller, a link to an absolutely wonderful video: sticky notes. This is from the same guys who brought you the infamous Diet Cokes and Mentos experiment. Also from Vahur, a link to some bizarre and disturbing vintage Marlboro ads. Oh, and fancy seeing a video of an 1100 barrel paintball gun creating the image of Mona Lisa in less than a second? If so, then today is your day (awesomeness begins around the 1:40 mark). I've mentioned Fantasybookspot several times in the past, and Damon Caporaso let me know that they've recently changed their name to Bookspot Central. India has become the first country to convict someone of a crime relying on evidence from this controversial machine: a brain scanner that produces images of the human mind in action and is said to reveal signs that a suspect remembers details of the crime in question. No peer review of this device has taken place, of course. Hey, it's with hunting but with electronic devices! Also from Sirius, a link to an article about the discovery of a new Mozart piece. Here's something fun to do (thanks to Jarod): test your color I.Q. I scored a four. Also, something that is going to the top of Eli 7.1's Christmas list: the fun fly stick. Then, the hat trick for Jarod with a link to a fantastic video of visible magnetic fields. ..despite "lots of arguments at home" he somehow succeeded. From Nate Carpenter, a link to an article about the discovery of a 650 million year-old reef--in the Australian outback. From Scott Ray, a link to some amazing pictures of Hurricane Ike. From Ben Younkins (via Shawn Elliot's Twitter feed), a link to photos of an abandoned Russian coastline defense battery. And at the same site, take a look at an abandoned horror. From Jesse Leimkuehler, a link to a spectacular image showing evidence of an object or objects colliding with Saturn's F-ring. 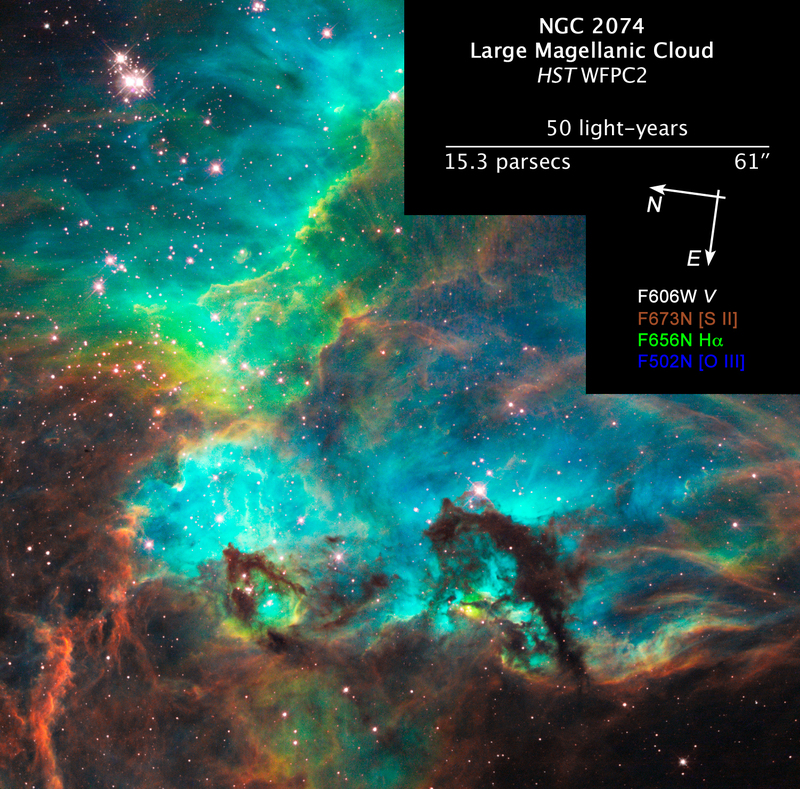 Also, a picture taken from the Hubble of a large Magellanic cloud. Here's a very cool idea--showing 24 hours of world air traffic (click on the "air traffic worldwide" link).